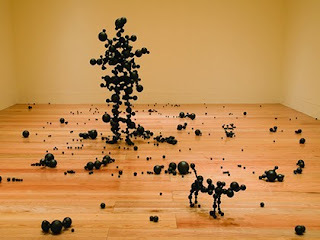 This is so far the best art exhibition at the moment in Mexico. 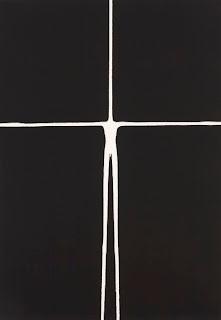 To know more about him there's an older post I wrote some time ago, but the reason for this new post is Anthony's exhibition on San Ildefonso, Mexico City. 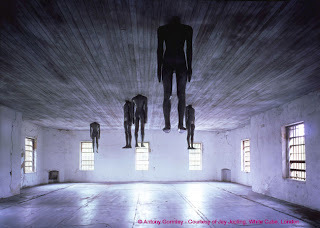 I went to see the pieces from Antony Gormley some time ago, and I’m still amazed with his works and meanings. Im guiding you through the exihibit with this post, so you can experience what I felt. The first room starts with a man on the floor with his arms wide open, and the reason for this piece, is to show that we own everything to the earth and that the man is hugging the earth thanking her for everything. Then as we move on, there’s a man made of lots of metal squares; you know it is a man when you see it form far away, but as you get closer and the squares get bigger you start to loose detail. This is what Antony wanted us to see, because is like seeing something very closely and losing the hole piece, the image, is like when you use a lot of zoom on a picture and suddenly the pixels are so big you only see squares; the same happens here, we only see pixels. Moving on there’s a pile of ammo, and on the next room all the walls are covered with bread. 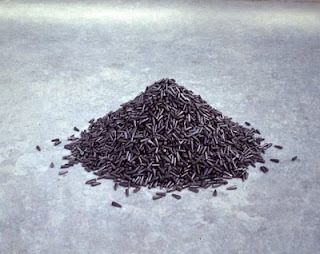 This is because the artist realized it takes the same effort now a days to produce seeds and ammo; seeds give life, and ammo takes it away, they are the same but they are completely the opposite. The world has come to a time where they are making more ammo than seeds, they are making more death than life. 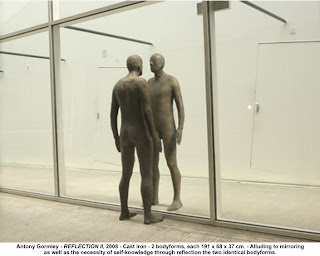 In the next room, there’s a man looking at the window and on the other side there’s exactly the same man looking back; you see it as his own reflection, but there are actually two persons. This is a way of making us think, that when you see your reflection, you actually see yourself, how you breath, what you are thinking, how you look, and you have yourself in front of you but you can never reach it because there will always be the glass or mirror in front of you. Moving on, you will see a lot of metals strings attached together without any order, but when you get closer, you see it is actually a man, like if he was made of dust. This is actually the opposite effect of the pixels, because when you see something very far away you only see a blurry spot and as you get closer it start to have a shape, but you never see what its made of or anything, just a shape. 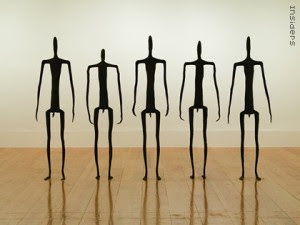 Then there are five small and skinny persons, but as you look at them, and see their differences, you realize that they each have a different posture and body language and that they each represent a feeling, just with the way they are standing, they are also looking back at us as if we where the artwork instead of them. Later we found ourselves in a room where everything is made of small spheres like atoms. 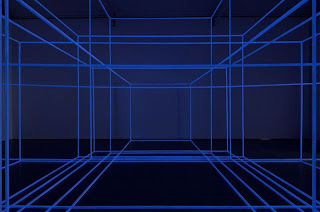 This room is a way of experiencing what things are made of, everything is made out of atoms, while you stay in the room you only see spheres toghether creating shapes. The next room was my favorite room. There we saw a lot of people on the roof, and all of them had their heads inside the roof. This was an inspiration from prisoners on jails, because the meaning of this is simple: your body can be trapped in a room, in a cell, in a car, or anywhere, but nothing or no one can ever hold your mind, the mind will always be free and there’s nothing that can stop that, no one can make you stop thinking. Your mind can always be anywhere you like. I found this amazing, problably the most important room, full of meaning and deeply profound. 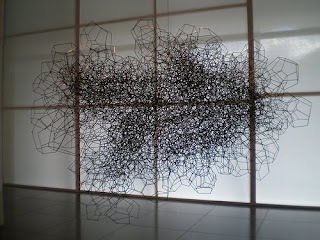 His next work was outside; it is was giant structure made out of steel making a lot of geometrical shapes. This is so you can walk under it and see the sky through the geometrical shapes and found the relation they have; you can see that everything in this world is related to geometry, math, and all the exact sciences. Then we found the dark rooms. 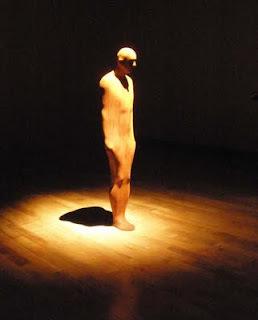 There, where we can see a line of light with pieces of bread on it; also another man (taken from Antony´s own body mold) like a death body, and finally we get to a big room with big squares made of neon light. In the last rooms there are some drawings with a lot of his works drawn. This was a great exhibition, there’s a lot to see, you end up with a very reflexive mind. If you have a chance go and check it out, also look for other pieces around the place like on the stairways, the rooftops and other weird places.